The L-shaped kitchen works well for small spaces and open floor plans. The work triangle is an efficient one. A table on the open side of this type of kitchen can make for a comfortable and casual feeling with room for guests and conversation. A table placed here can also be used for food preparation when required. This layout is commonly employed in a farmhouse kitchen where the food preparation and eating table are in the same room. The U-shaped design also employs an efficient work triangle. This layout generally works well for one or two cooks but if the width of the U is narrow it is difficult to accommodate more people. If the U is too wide this kitchen becomes less efficient in terms of walking distance from each point of the working triangle. A variation of this layout is where one or part of a wall is open to form a pass-through counter or peninsula counter (in this image it could be open between the fridge and the sink wall). One of the advantages of this kitchen layout is that it discourages traffic through the preparation area. However, if there are full height walls on all three sides, this can also be a disadvantage since there is little room for socializing with those who are not involved in the food prep. 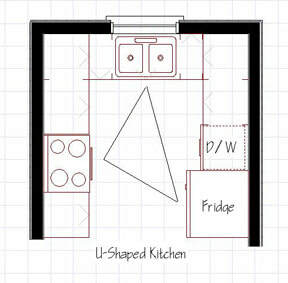 U-shaped Kitchen Layout Design The U-shaped design also employs an efficient work triangle. This layout generally works well for one or two cooks but if the width of the U is narrow it is difficult to accommodate more people. If the U is too wide this kitchen becomes less efficient in terms of walking distance from each point of the working triangle. A variation of this layout is where one or part of a wall is open to form a pass-through counter or peninsula counter (in this image it could be open between the fridge and the sink wall). 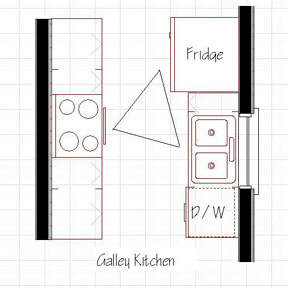 ​In general, the galley or corridor kitchen is commonly designed for a single cook or for small spaces. 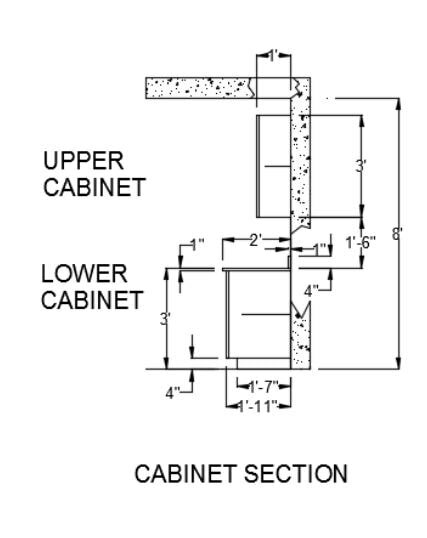 But if the distance between the two counters is somewhat wider than a traditional galley kitchen (which is often 3 to 3-1/2 feet from counter front to counter front) say perhaps 5 feet and if additionally, one wall is all or partially open this kitchen layout design can accommodate more than one cook. By opening one wall, seating can be created on the other side of the open counter. 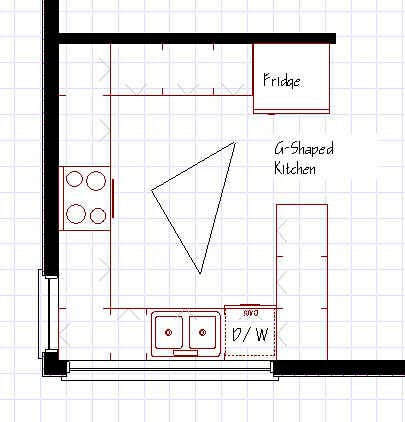 The G-shaped kitchen floor plan provides the same efficiency of the U-shaped kitchen layout design with the extra advantage of having a peninsula that can be used as an eating counter or for a place for those not helping out with food prep to sit and socialize. One drawback is that the enclosed space could feel a bit claustrophobic. This could be alleviated by large windows and open views into the rest of the home. ​This layout is often employed in small apartments or open-roomed homes such as vacation homes. All appliances end up along the length of this counter. The working triangle is flattened to a straight line which, for one or two cooks preparing simple meals, can still be functional. Ideally the counter length should be kept to a reasonable length. Once the counter gets too long the efficiency of the kitchen is really degraded. By placing a table four or five feet from a one wall kitchen design you can help create the feel of the kitchen as a room and also provide extra space for preparing foods.